Sabine Pinon-Amoore is an artist and a free spirit. 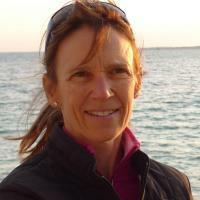 She currently splits her time between Aureille in Provence and Byron Bay, Australia. She can hardly deny her artistic predisposition – her mother was an art restorer at the Louvre in Paris, and her father worked at the American Art Foundation (Paris). Sabine and her husband are entirely dedicated to Atelier Fourwinds in Aureille (read the full story here) and an art supply and workshop space the Still @ the Centre in Byron Bay. 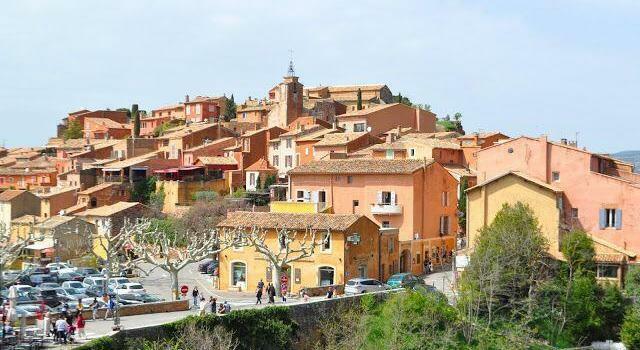 The following is her story of arriving in Provence and her first encounter with the natural ochre hues in Roussillon. The decision for such a dramatic parting from my pleasant enough life of 30 years came after receiving a divine order to do so (but that’s another story) and, much later, I would realise that that day too had marked the official start of my Personal Revolution or, to put it more gently, the Eat/Pray part of my quest (yes Love would come too but not for a few years yet and that is definitely another story). Leaving behind my comfortable life working for an art expert and my penthouse abode behind Notre Dame on the Ile Saint Louis, I was setting off for new quarters in a little village in Provence in a rundown house -aptly called Mes Ruines!- with few commodities: some electricity sockets, a sink and shower but no hot water, the package taken on board with… total delight! Plus the hotel I was to work for was throwing in the lodgings for free and F R E E was exactly how I was feeling. Early the next morning I was behind the reception desk of my 4-star hotel.The place was a little beauty, just a few kilometres away from the historical village of Gordes. My job at the reception was not challenging, the dynamics of a hotel with an absentee manager… a tad more! Nevertheless the summer months went by pleasantly enough, with time to explore in depth the beautiful Luberon. When the grapes turned blue-black and their leaves to astonishing splashes of orange and rust, clients became few and far between, and so I took over the job of tiding up the rooms in the evening (and leave there the little treats on the pillows that go with the 4 stars). What a very interesting occupation that one was! People, quite civil on the outside, going to restaurants all dressed up and elegant every night, would leave behind the messiest of rooms! There are always benefits from going onto the other side of mirrors. 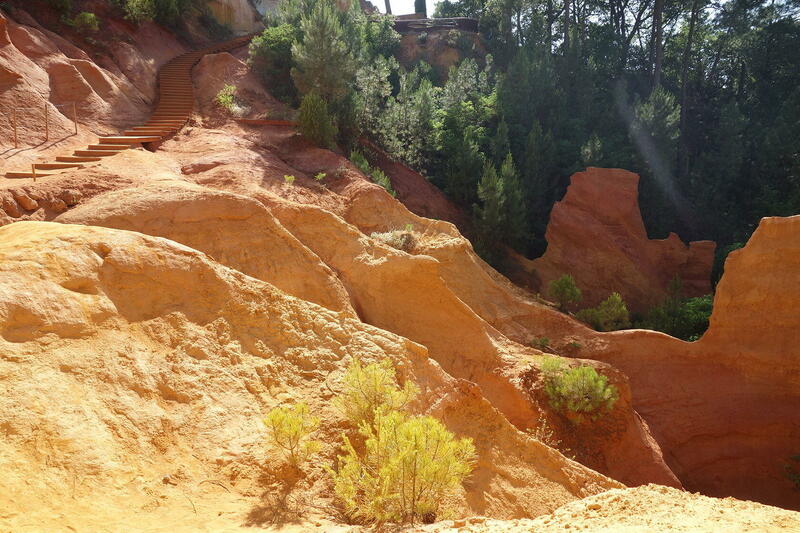 My hotel was only a few kilometres from Roussillon, one of the most stunning open air ochre sites in France. Visits there were highly encouraged by my good self (not after doing this job I can tell you) as one of the highlights of the area. Guests would return enchanted and…orange! The soles of their shoes filled with ochre, their feet, their clothes, their hair too it seemed. Bathtubs would be ringed with colour, towels with indelible patterns. As much as I tried to consign them to oblivion, drown them down the drains, there seemed to always be that one little particle left that would turn the whole effort into yet another puddle of pumpkin soup…which is exactly how you make paint of course! Pigment and water will do. Might not stick too much to the support though but paper will drink it up (and bath towels too!) Add a little binder –soap or face cream which most probably will not stand the test of time but are on hand at this stage– and it’s a very acceptable art material you’ll get and a very distressed handmaiden to boot. 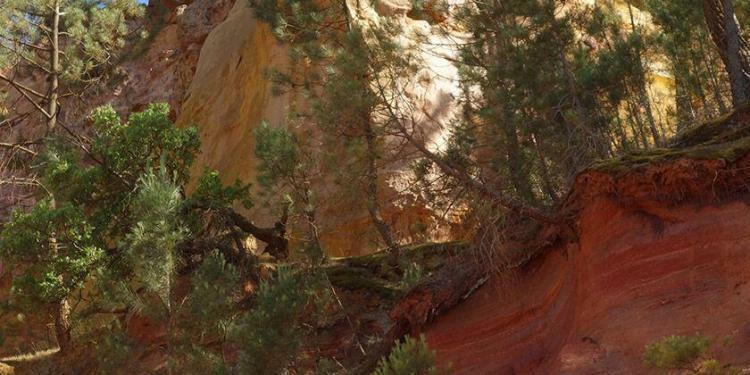 These days, as owner of an art store and passionate art materials researcher, I know so much more about the awesome ochres and their incredible variety of hues from yellows, to oranges, reds and even violets. But is it Ochre? or Ocher? I’ll choose the first spelling. No offence intended, ochre is simply more visually pleasing to me, in all probability only because it’s the same as the French spelling I have always been familiar with. Personal taste will make me chose again the more mineral sounding French ochre. The h being inaudible, that “cre” screeches like raw Earth crunched in a rough mortar. I can virtually hear in this cre the ochre pigment being separated from the sand and other earthy bits that held it together as a colourful mass. The patient and relentless grinding, that slightly annoying sound can be heard again in “cr-aie” (chalk… think of it on a blackboard) or in “cr-ayon” (pencil… being sharpened on sandpaper perhaps?) Strangely, I find it also a pleasing sound as that token of planet Earth holds the promise of tangible colour, brings a whiff of its potential in the hands of men. 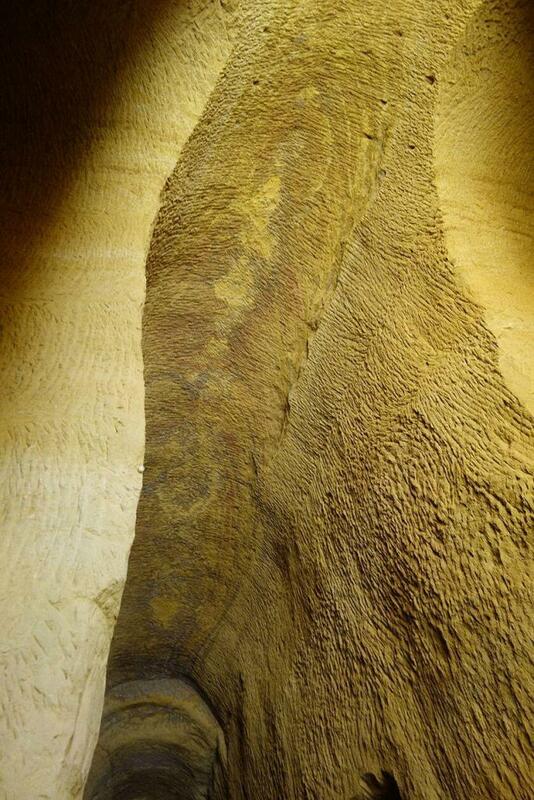 Ochre, to say the least, has been around for us a very very long time. It might well be one of, if not the first thing, humans ever exchanged, offered or possibly traded! The colour trails can be followed in many different cultures and on all continents but in the Blombos caves of Africa, evidence of Homo sapiens grinding ochre in shells with an unknown, as by now vanished, binder into a paste goes back some 100, 000 years . That’s nearly as long as Sapiens has existed! There, men and/or women went as far as shaping and marking ochre crayons with hatches. Was it a primitive design or some kind of proprietor/provenance ‘logo’? Also, we can only wonder as to the precise use of these blocks of pure colour (or as we would later call them pigment sticks/soft pastels). 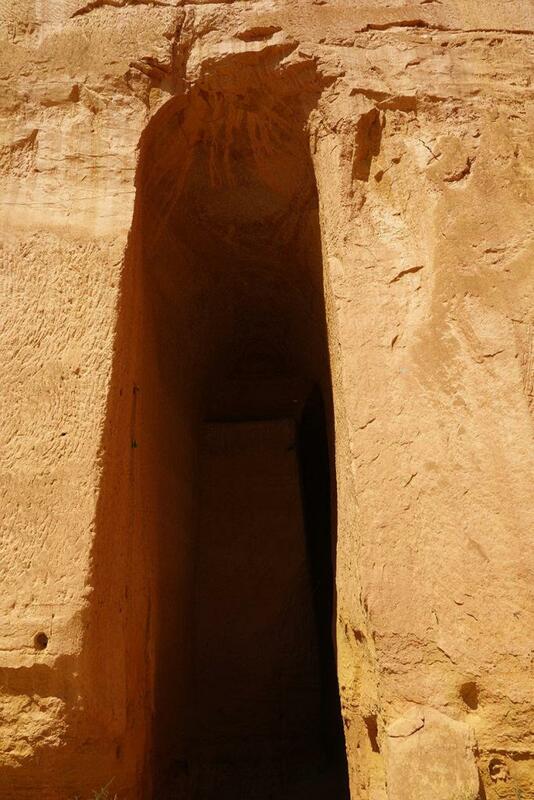 Certainly no attempt at interior cave decoration seems to date that far back. Educated guesses lean towards adornment and presumably ritual too. Funeral rites apparently often came with a fine layer of ochre. In Australia, where the first evidence of a ceremonial burial was found, the “Mungo man” named after the near by lakes was buried in red ochre some 42,000 to 62,000 years ago. Elsewhere too, blood red ochre and bones seem to keep good company (and ochre has siccative properties which dries bodies faster). Nowadays I perhaps even believe/dream we all come from an uninterrupted lineage of artists with pigments coursing in our DNA like blood in our veins– but back in the day when I accepted this receptionist job for the summer, I had never given a thought to these colourful powders, had not a clue they were pigments or what that meant, and no premonition the stuff could be… well, just about indestructible (or at the very least, not wanting to sound too dramatic, insoluble). But if the above story does not help you remember forever the difference between a dye which is a soluble colorant used for textiles, etc. and a pigment which is an insoluble micro-particle of colour… I give up! That story goes back nearly 30 years and today you cannot simply go and trek in the colourful open air ochre site. You need a ticket and there are opening hours and pretty little wooden paths so your shoes don’t get too dirty (payed for presumably by the local hotels!) and these take you where they want you to go, which to be fair are the most beautiful vistas. 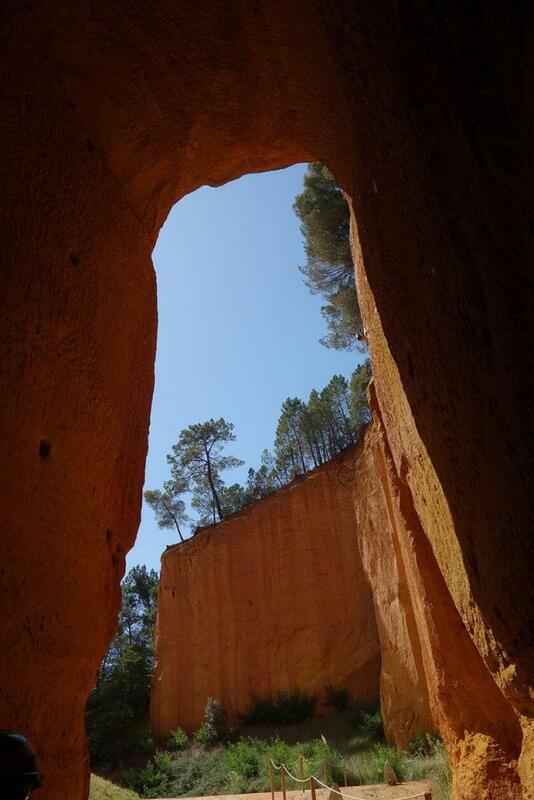 Previously there was hardly anyone there and no one to stop you believing yourself a lone ranger entering this dangerous gorge between two menacing mesas while the Indians (i.e. the kids) giggled behind the pink and purple pinnacles waiting to jump on you and shower you with coloured soil. Everyone would return from these walks as from the Holi festival, happy and exhausted. Times have changed, still it’s easy to imagine even now that you are walking in the tracks of ancient fellow colourmen, in awe as you are about our stunning painted Earth. There, for over two centuries, ochre has been exploited (apparently today, not far behind this site, is one guy on an engine and this ‘power’ has replaced a little industry that once occupied many a strong men in the area). The mines were dug from the ground down, if you are wondering. The first metres were no good, too much sand, but when it was deemed worthwhile then the men with the very specific job of tracing the rounded arches with a sort of scythe and long sweeping gestures would enter the earth horizontally. Lesser paid men would then dig the sides. Together, they eventually opened up 40 kilometres of galleries that now burrow the ground in that place. Not too close to one another so that the ‘pillars’ can support the natural roof. Ochre was and is still used for painting houses of course and for other purposes (strangely enough until recently as an inert stabiliser for natural latex which would allow it to be moulded into a variety of useful things like baby soothers or sealer rings for your jam jars… Remember these were orange once upon a time)? 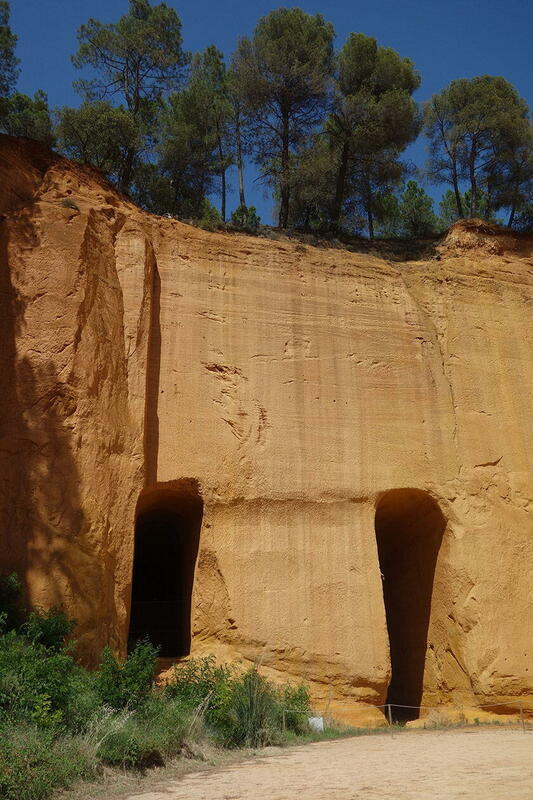 However, although profitable enough, mining ochre has built no one’s colossal fortune. Today a kilo of it is worth 4.90 euros whilst other pigments like the Cadmiums around 100 to 150 depending on colour, Dioxaxine Purple 256 euros and Lapis Lazuli 2300! I sourced these figures from the Kramer catalogue that supplies many a paint maker and if you ever wondered why there are series in all respectable paints and such a difference in price between them… now you know! 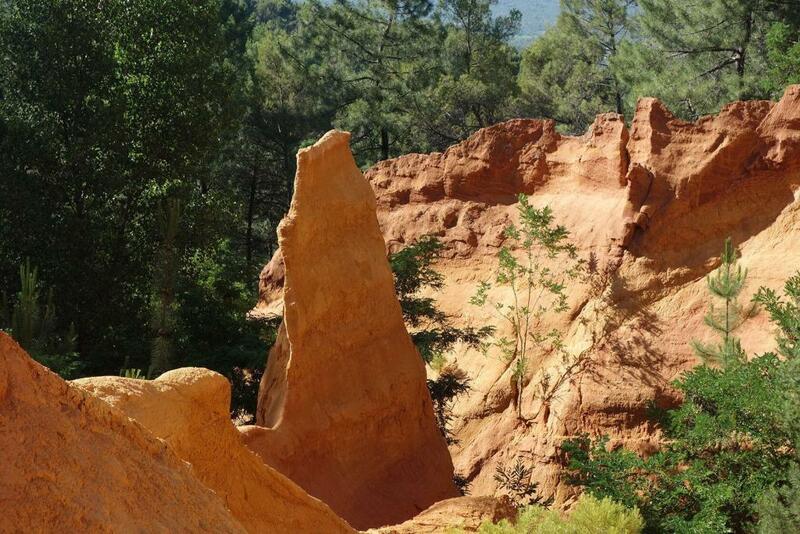 Mining was not the last step in producing a high quality ochre and there is still one more place, which has opened a few miles from the village of Roussillon proper, you might enjoy visiting –if nothing else for its ochre supplies and extensive bookshop. L’usine Mathieu, now turned into The Conservatoire des ochres et de la couleur, is a place where you can learn about ochres but also see the old factory where the raw clay was washed to separate the grains of (+/-80%) sand from the particles of ochre*, then decanted in large basins, from which the water was drained and the ochre left to dry. Later, cut into bricks, crushed and sifted, it would be classified by colour and quality with the finest set aside for artists’ pigments. As ever a small market. 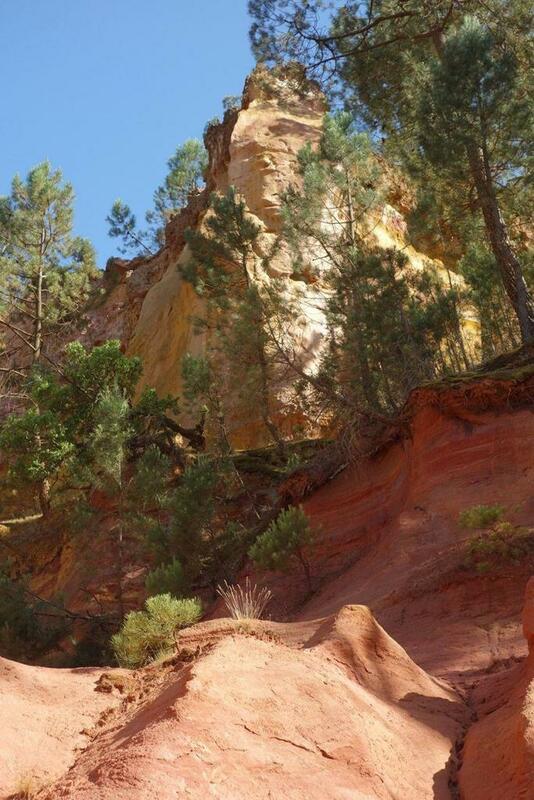 As one of the signs along the walk optimistically declares: “Roussillon is converting its mineral inheritance into a universal melting pot of know-how concerning colour” and, if you share this passion with me, you can go to my blog to read more about colour and paint but I also hope one day you’ll make it to Roussillon! The mines are fresh at all times of the year (around 10ºC) so bring a jumper: Mines de Bruoux, 1434 route de Croagnes, 84400 Gargas. They are opened from April until October. Phone: +33 (0)4 90 06 22 59 or go to In summer they also have concerts and plays there in the evenings which would be quite lovely in that dramatic setting. 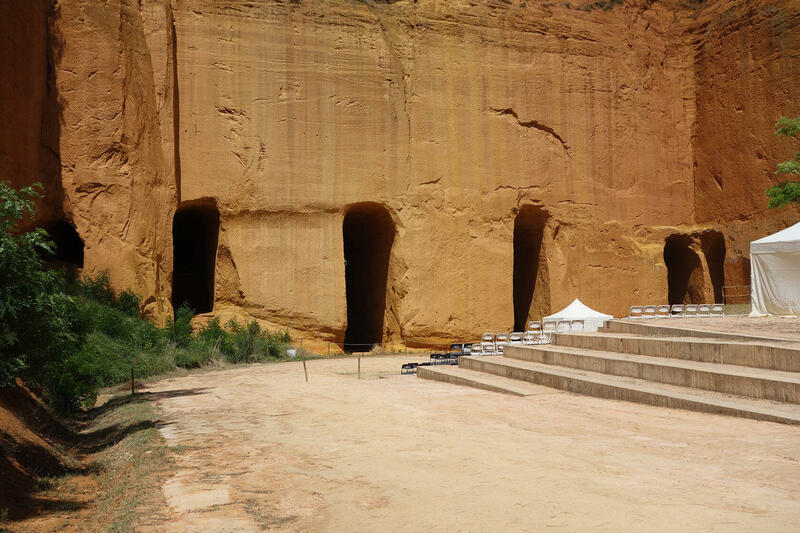 The factory Usine d’ochre Mathieu/Conservatoire des ocres et de la couleur, D104, 84220 Roussillon, is open every day from February 1st till 31st December. Phone +33 (0)4 90 05 66 69, for more details.